So, you’ve been picked to be a member of the bride’s squad. Congratulations! You’ve weighed in on the bachelorette party plans, ordered your bridesmaid dresses and popped a bottle or two in celebration — what else is there to do? Being a member of Team Bride is equal parts fun and responsibility, and your bridesmaid duties will begin the minute she pops the big question — “Will you be my bridesmaid?” — and won’t end until the last mimosa at the post-wedding brunch. 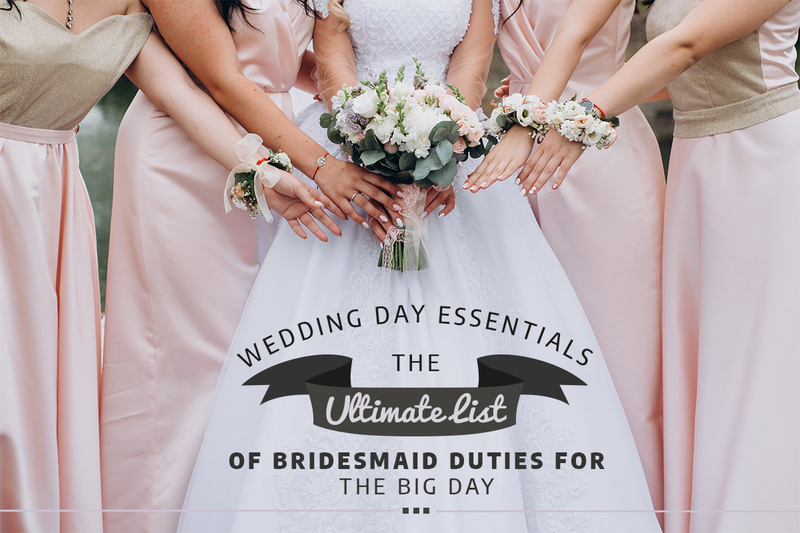 But the big-day duties are arguably the most important, so you’ve got to make sure you’re ready for anything during the wedding weekend. Though your list of duties is lengthy, there’s no need to stress. You’re already a good friend, as evidenced by your bridesmaid status, so you’ll be a natural! Here’s everything you’ll need to handle for the bride-to-be on her special day, from supplying the a.m. lattes to gathering her things after last call. Throughout the day, but especially in the hours leading up to her big walk down the aisle, your job as the bride’s bestie is to be her go-to gal. Do your best to anticipate everything she might need at every point in the day, whether it’s a handkerchief to dry her tears or assistance fastening her next-level bridal heels. Be on Time — If you’re not early, you’re late: No piece of advice is truer on wedding day. It should go without saying, but don’t show up to any wedding-related event late. The thing is, nothing can start without you there, so make sure to be on time with bells on. The bride will probably assign you a timeslot for hair and makeup, with some as early as 9 a.m., so pick one that you know you can reasonably achieve. Bring Coffee — How to be a hero on her wedding day: Start with a cup of good coffee. The key to knocking this duty out of the park is to know her Starbucks order without having to text her to ask because she’s got more important things to think about. Depending on the crowd, you might also want to be in charge of supplying the wedding morning cocktails. Just make sure the bride is down for a little boozing before the start of the ceremony, and don’t make the drinks too strong. Offer Your Assistance — Don’t wait to be assigned a job. Ask the bride, the mother-of-the-bride, the photographer and the other bridesmaids if there’s anything you can do to help the day run smoothly. There are a hundred moving parts to a wedding, and it’s inevitable — a dozen people will be hurling questions her way while she’s getting dolled up. Do what you can to field the inquiries and provide the bride with everything she needs to enjoy her day without extra stress. Help Her Get Dressed — One of the most important jobs for members of the bride’s squad is helping her get into her wedding gown. Let’s face it: Those things are not designed to be tossed on without additional help. You might have to do a whole lot of lacing, buttoning and bustling while you’re getting ready — and you’ll likely be assisting during quick bathroom breaks. Do yourself a favor and watch some YouTube videos on how to bustle a wedding gown. Trust us, you’ll be the wedding day MVP if you show up prepped and practiced in the art of bustling. Don’t forget to make sure the photographer is ready to shoot when you’re all helping her get into her gown. Calm the Bride — Even the most well-prepared brides get butterflies before their first look or walk down the aisle. Do everything you can to help ease the nerves so that she feels confident and ready for her debut. 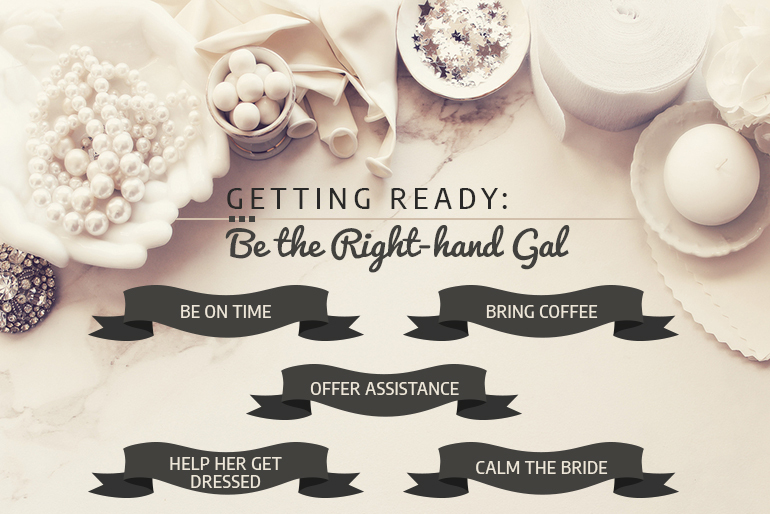 Simply asking her what she needs at any given moment will go a long way in helping the bride avoid panic. Fair warning to first-time bridesmaids: The picture-taking portion of the day can be boring at best and downright maddening at worst. But know that everyone — even the bride and her spouse-to-be — will be ready for it to be over by the end, so the best thing you can do is to keep a positive attitude, lighten the mood and simply be game for whatever. Prepare for Emergencies — This is the time of day when a wedding day emergency kit will seriously come in handy. Imagine, for example, that someone’s bridesmaid dress — or, gasp, the wedding gown — snags or tears in the photo shoot process. Or that someone’s self-tanner rubbed off onto her dress. Your survival kit should have all the necessities to handle these kinds of snafus, including a sewing kit, some safety pins, a stain-remover pen and extra bobby pins. If there’s rain in the forecast, try to help secure some umbrellas or facilitate indoor shooting locations. Offer to Touch Her Up — Consider adding a few touch-up essentials to your bridesmaid-to-the-rescue kit, including some blotting paper to prevent sweat and moisture from ruining her makeup as well as some travel-sized bottles of her foundation, lip gloss and eyeshadow to provide instant touchups. You could even ask the photographer’s assistant to hang onto a small makeup bag or cosmetics case filled with all these day-of essentials so you don’t have to worry about them while you’re getting your picture taken. Strike a Pose — During this part of the wedding activities, the photographer — and no one else — is the boss. Don’t try to advise the pros and know that the photography team is more than likely doing exactly what the couple asked them to do. Typically, the newlyweds-to-be will have conferred with the photographer beforehand to come up with a list of must-have shots and poses. Be prepared to take pics in a hundred poses and combos, with the bride, the bridesmaids, the groomsmen and solo. Don’t complain, even if it seems like the shoot is taking forever. Let the Bride Shine — Make sure that no member of Team Bride is overshadowing the lady in white! The person who will know how to showcase her the best is the person behind the lens, so take direction gracefully as it comes. If you notice that one of the bridesmaids is taking away from the bride, quietly ask her to step out of the frame and allow the bride to be the star. When we think about quintessential bridesmaid duties, we often think about holding the bouquet and adjusting the train during the “I do” portion of events. Indeed, these responsibilities are crucial to the big day and should not be taken lightly! Making sure the bride looks perfect beneath the arch or at the altar should be your principal consideration when the couple is saying their vows. Fix Her Dress — Typically, the maid of honor will be in charge of adjusting the bride’s train so that it lays properly while she’s saying her vows. However, if it’s a particularly long train or if the dress has special features that need to be taken into consideration, this might be a job for the entire crew of bridesmaids. 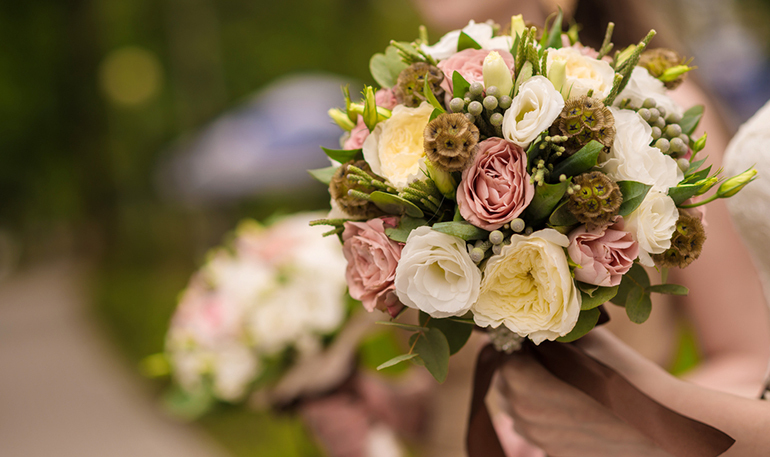 Hold Her Bouquet — During the ceremony, she’ll need both her hands to exchange rings, hold her partner’s hand and perform any special traditions, like the unity candle or sand ceremony. Thus, you’ll need to step in and hold her bouquet during a big chunk of the ceremony. The details of the fixing of the dress and holding of the bouquet — who should do it and when — can be ironed out during the rehearsal. Hand Her a Hankie — Sadly, a mini pack of tissues doesn’t exactly go with her outfit. If you can, figure out a way to discreetly hold some tissues during the wedding so that you have something on hand in case there are waterworks mid-ceremony. After the makeup is done, the photos have been taken and the couple is officially hitched, it’s time to party! But don’t immediately head straight to the bar for shots. There is more pomp and circumstance to be had at the reception, including toasts, dances and the cutting of the cake. Nail Your Grand Entrance — Usually, the couple will have the entire bridal party make a grand entrance to the reception. Be sure that you’ve ironed out the details of this portion of the day with the bride. She may want you to enter with the groomsman you walked down the aisle with or with all the girls at once. She may want you to lighten the mood with a dance, a funny prop or an upbeat song, or she may prefer to keep this portion formal. Let the bride guide the vibe. 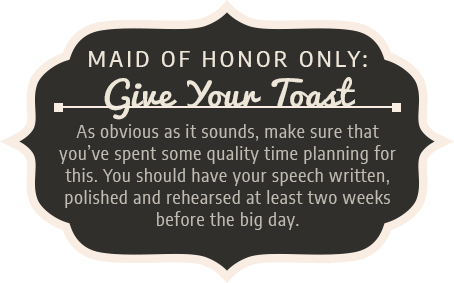 Maid of Honor Only: Give Your Toast — If you’re the maid of honor, the primary responsibility you’ll have that the rest of the bridesmaids will not have is giving a maid of honor toast. As obvious as it sounds, make sure that you’ve spent some quality time planning for this. You should have your speech written, polished and rehearsed at least two weeks before the big day. The emcee will usually invite the maid of honor and best man to give their toasts during dinner, traditionally after the fathers (or mothers, in many cases) give their toasts to the new couple. Tip: if you’re in charge of raising a glass, make sure to wait to drink any alcohol until it’s over. Keep the D.J. on Track — More than likely, the newlyweds had a very clear vision for the music before the wedding commenced. But during the reception, they’ll be bouncing from table to table and mingling with their guests, so they won’t have time to keep tabs on the soundtrack. Ask the couple beforehand what they envision for the music and if there are any songs, artists or genres that are off-limits or must-plays. If you have to step off the dancefloor to keep the DJ on track, do so politely and only to honor the couple’s vision. In other words, don’t request the songs you want to hear just because you’re bored with the DJ’s picks. Gather Her Things — Another important role of the bridesmaid crew during the reception is to make sure that all the bride’s personal belongings are accounted for. Ideally, she’ll have all her items — her phone, some cash and lip gloss — neatly gathered in a pretty bridal clutch — to make your job easier. In the event that she traded in her high heels for some comfy bridal flats, make sure to grab her heels and anything else she may have left behind after dancing the night away. Help Clean Up — Depending on the size, budget and complexity of the wedding, you may be employed to help gather decorations, remove linens and collect gifts after the final dance. Ask the bride beforehand what she plans to do for cleanup — will there be a crew, or does she plan to have her family and friends pitch in to help? Remember, the sooner it’s all cleaned up, the sooner you can head to the after party! At the end of the day, your role as a bridesmaid is to provide your bestie with whatever she needs to enjoy the day she’s been planning and obsessing over for years, including emotional support. In everything you do, make sure that you put the focus on her and remind everyone that it’s her day and no one else’s. 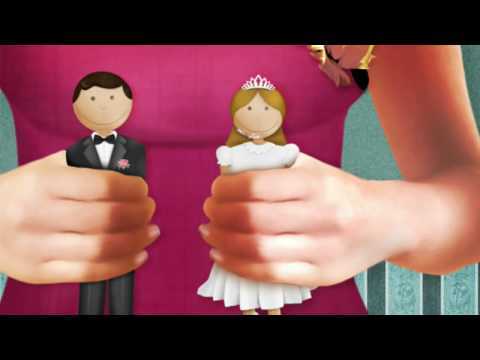 With any luck, she’ll do the same for you when it’s your turn to tie the knot. Dessy is always here to help you be the best bridesmaid you can be!